I really feel like if you serve soup for dinner, you need some sort of homemade bread or muffin to go along with it. 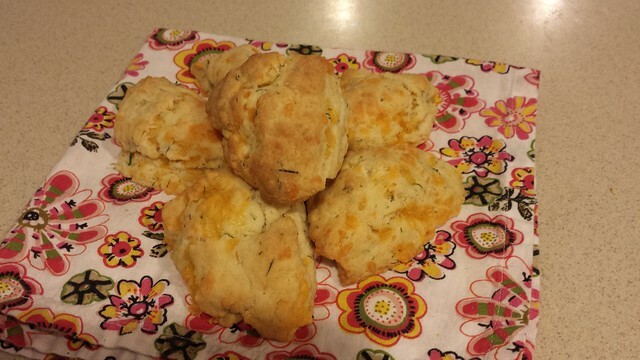 I have pretty much eaten my weight in goat cheese biscuits this winter, so when I made potato soup tonight, I decided to revisit these savory scones to go along with them. Having made the recipe before, I knew that it yielded way more scones than I needed so I figured I’d half the recipe. Unfortunately, I’m quite poor at math, so I split the whole recipe in half up until the end, when I added a whole cup of cream instead of a half cup, so, obviously, I ended up making the whole recipe of them. The one I posted here makes about 12 medium-sized scones, a good amount to serve with dinner. Like all scones, what keeps the flakiness intact is streaks of unincorporated butter. Be mindful about that as you mix, especially if you use a stand mixer. 1. Preheat your oven to 400. Using either a large bowl or mixer, mix the flour, baking powder, and salt. Cut the butter into small, centimeter-sized pieces and toss them in. Mix briefly until the pieces of butter have broken up a bit. Add the eggs and cream and mix until just incorporated. 2. Grate the cheese and chop up the dill, fold both into the dough. Turn the dough out onto a floured surface and mold into a big rectangle, roughly an inch tall. Using a bench scraper or chef’s knife, cut triangles off and transfer to a baking sheet (I do 3-4″ hypotenuse triangles). 3. Bake for 16-18 minutes, until the tops begin to brown.